PORTLAND, Ore.–Scientists have produced an extremely bright spot of light that can travel at any speed–including faster than the speed of light. Researchers have found a way to use this concept, called "flying focus," to move an intense laser focal point over long distances at any speed. Their technique includes capturing some of the fastest movies ever recorded. 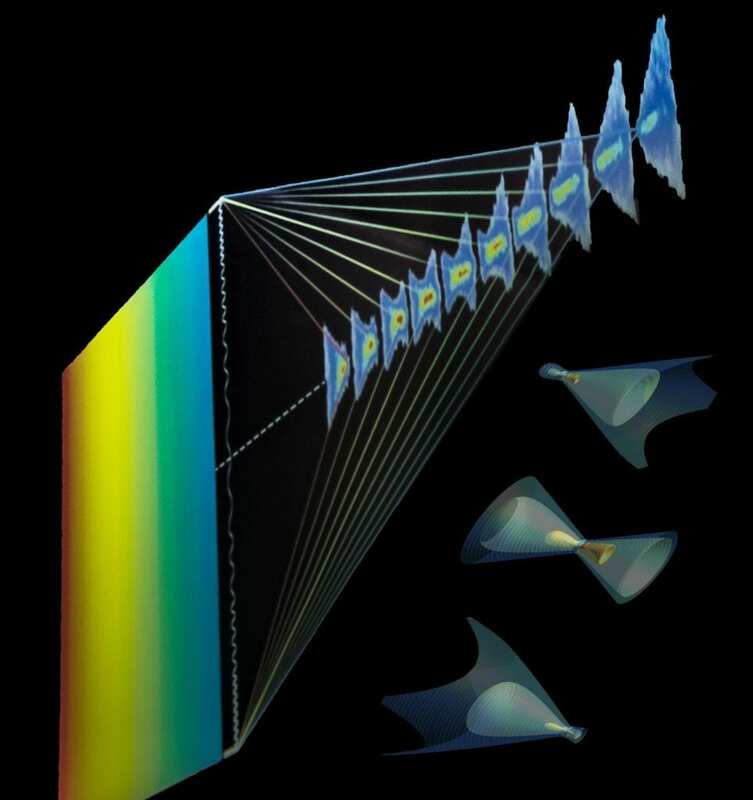 A "flying focus" combines a lens that focuses specific colors of light at different locations with the recent Nobel Prize winning chirped-pulse amplification technology, which organizes the colors of light in time. Imagine a laser producing a continuously changing rainbow of colors that start with blue and end with red. Now focus the light with a lens that concentrates the red light close to the lens and blue light much farther from the lens. Because of the time delay between the colors, the high-intensity focal point moves. By changing the time delay separating the different colors, this spot can be made to move at any speed. "The flying focus turns out to be super powerful," said Dustin Froula, the Plasma Physics Group Leader at the University of Rochester's Laboratory for Laser Energetics. "It allows us to generate high intensities over hundreds of times the distance than we could before and at any speed. We're now trying to make the next generation of high-powered lasers and flying focus could be that enabling technology." His team, supported by the Department of Energy Office of Fusion Energy Sciences, will be presenting this research at the upcoming American Physical Society's Division of Plasma Physics meeting in Portland, Ore.
"Our group set out to design an experiment that would measure the propagation of a focal spot at any velocity, including 50 times the speed of light. This required a new diagnostic that could make a movie with frames separated by a trillionth of a second," Froula said (Figure 1). In addition to helping usher in the next generation of high-power lasers, this research has the potential to produce novel light sources such as those that generate light of nearly any color.